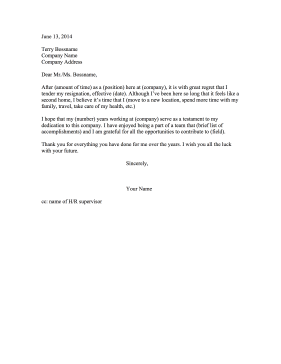 This resignation letter can spark your own heartfelt goodbye after leaving a long-term position. I hope that my (number) years working at (company) serve as a testament to my dedication to this company. I have enjoyed being a part of a team that (brief list of accomplishments) and I am grateful for all the opportunities to contribute to (field). Thank you for everything you have done for me over the years. I wish you all the luck with your future.